Never in my wildest dream did I imagine myself staying up until the wee hours of the morning to study and actually falling asleep in the library! I've been a consistent straight A-student during my undergraduate years and studying, comprehension and memorizing before the exams were never a problem. Well, graduate school is a totally different ballgame and the fact that memory performance declines as a person matures (yes, this is based on experience). Two weeks after the first set of our dreaded compre exam, we flew to Singapore for a 5-day International Business Management course which was a welcome de-stressing break from those sleepless nights of non-stop studying. Our flight arrived on time at Singapore Changi Airport and after getting in to our assigned buses, we finally made our way to the "City of Fines". The week-long tour was a blend of cultural immersion, visit to Singapore's themed attractions and landmarks, enriching seminars and interesting company visits. Established in 1973, the Marketing Institute of Singapore (MIS) Training Centre is a non-profit organisation that offers a wide range of programs in various specialisations apart from marketing. The centre is the training arm and national membership body for sales and marketing of MIS, one of Singapore's leading private education institutions. The iconic campus of La Salle College of the Arts is actually located just a block away from our hotel. One will immediately notice the contemporary design of the building where students are fostered to be creative, innovative and be successful in their chosen specialism in the field of arts. Swiftlet, the bird that produces the popular bird's nest (commonly known to us as the most coveted Nido Soup), is now being housed in farms for easier access to their valuable nests rather than the old-fashioned harvesting method where people have to climb caves to collect them. The Swiftlet Garden in Singapore aims to produce anti-cancer and stem cell therapy supplements through its extensive research and development programs. Other products include chocolates, health drinks and cookies with bird's nest extract (which also claims to have health benefits) that you can actually purchase in the sales gallery located within the compound. You probably lived in another planet all your life if you have no idea what Yakult is. Determined to promote good health for everyone, Dr. Minoru Shirota created a probiotic dairy product made from cultured milk with L. Casei strain, the lactobacilli that suppresses harmful bacteria in the human intestines. Eighty years have passed and Yakult is now considered as the most successful Japanese beverage available in over 33 countries throughout the world. 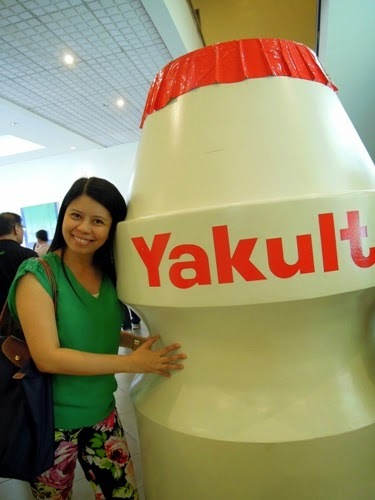 While most of us in the Philippines are used to the original tangy/yoghurty taste of Yakult, Singapore enjoys a variety of flavours that ranges from Ace Light (for the weight watchers), Orange, Grapes and Green Apple -- all in 100ml packaging. Yes, no more bitin feeling!